This card emerged from my continued experimentation with Emboss Resist and inky layers , however, it wasn't an easy birth! Some cards come into existence easily, gracefully and in an ordered manner - which can't be said of this one! This card emerged, kicking and screaming, in the breach position! Not happy with the way things were going, I kept changing plans and trying different things, so it's hard now to remember exactly what I did and in which order! I can tell you that I started with Shimmery White cardstock. 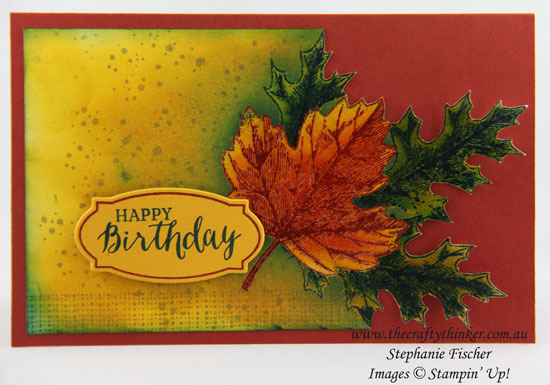 I inked the top leaf with Versamark and Cajun Craze inks, stamped it and clear heat embossed it. 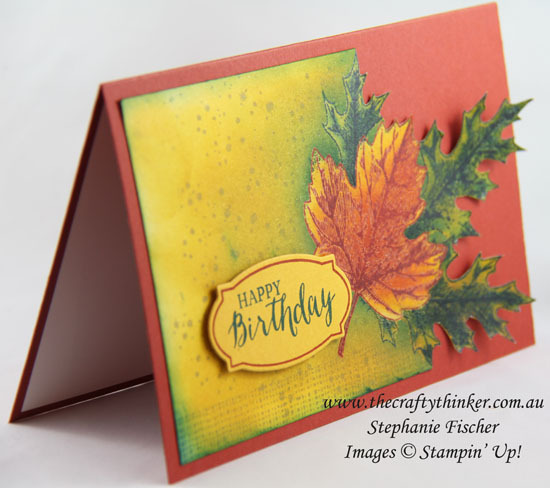 After sponging on colour, I used the Embossing Buddy and then sponged Versamark all over the leaf. 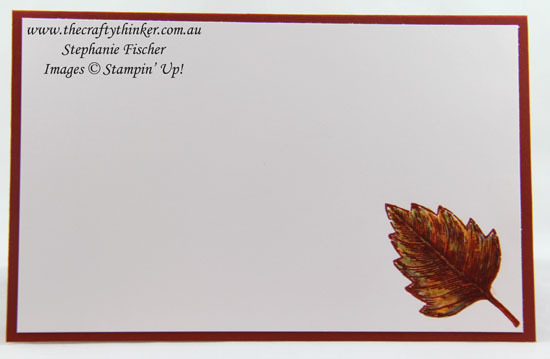 After adding the embossing powder, I cleaned away any excess from the edges of the leaf with a clean, dry paint brush then used the heat tool. The next step was to sponge the entire card with yellow ink - it looks to me like I may have started with a lighter yellow (maybe So Saffron or Daffodil Delight?). I would have let the ink dry and then given it a very thorough wiping with the Embossing Buddy. Using Versamark, Emerald Envy ink and a different leaf stamp, I then repeated the process I used for the for the first leaf - stamping, clear heat embossing, adding colour, wiping with the embossing buddy, adding versamark all over the leaf, adding embossing powder, removing excess with a paint brush, heating. I would have done that for each leaf. I sponged and stamped with a variety of inks and cut around the leaves before adhering the panel to a Cajun Craze card that I made to fit the panel. I made a label with Crushed Curry card, Cajun Craze and Basic Black inks, the Rose Wonder stamp set and matching framelit and popped it up on Stampin' Dimensionals.